Learn how to be Happy any time, any place... Guaranteed! Here is the perfect way for you to be happy: G-B Meditation. Be ready for this powerful technique. Gratitude is one of the most powerful emotions a human being can experience. The ability to change your reality IS within your reach! Having the ability to change your reality IS within your reach! 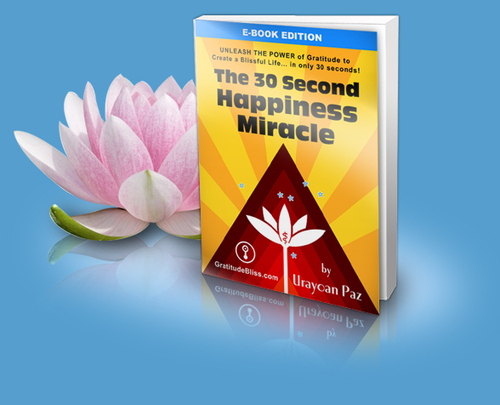 this into a 24-hour Global Meditation in just 30 seconds each hour is phenomenal! Anyone who needs a happiness boost really needs to read this. Hi, I have read your primer and think it is one of easiest methods to attain basic happiness. in simplicity, in Gratitude Bliss. Highly recommended! Experience the real meaning of Happiness Now! Create a Blissful Life... in only 30 seconds! Use This Technique and you´ll change your mood in just seconds!